Modern Cairo is a dazzling varied metropolis that hums with activity all year round. A city of contrasts, it is a place where donkey carts jockey with Mercedes along the crowded streets, where a thousand minarets adorn the skyline alongside a sea of skyscrapers. Each of the Pagan, Christian and Muslim civilisations which Cairo has hosted has left its imprint in the form of customs, celebrations, monuments and artifacts. Monuments such as the Pyramids, Sphinx, lively bazaars, famous Islamic Mosques and ancient Coptic Churches open a window of a glorious past. A centre of cultural, social, intellectual, economic and political activity, Cairo also holds a diversity of world famous hotel chains, glittering nightclubs, casinos and discos. Cairo is a city that never sleeps, being the cultural and commercial centre of the Arab world and the largest in Africa and the Middle East . Egypt occupies the Northern Eastern region of Africa and covers a total area of 1,001,400 sq. km. Its population of 74 million utilises only 4% of the total land, while the rest is desert. The very existence of the country depends on the slender ribbon of the Nile , the world's second longest river. Cairo is Egypt 's capital, where East meets West, combining the exoticism of one and the sophistication of the other, is the largest city in Africa and the heart of the Arab world. Cairo strikes one as a land of vivid contrasts. Its ancient civilisation, unique history and culture blend harmoniously with the modern refinements of the 20th century. 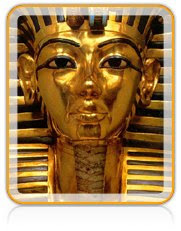 The Egyptian Museum is the most important depository of Egyptian antiquities anywhere in the world. It features artifacts from the Pharaonic and Greco-Roman periods, including the celebrated mummies of ancient Egypt 's kings and Tutankhamon's treasures. 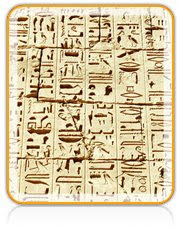 The Pyramids of Cheops, Chephren and Mycerinus were reckoned by the Greeks to be one of the seven wonders of the world. A single pyramid is built with 2,300,000 blocks, each weighing an average of two and a half tonnes. In the face of such immensity, one cannot help but feel the wonder and awe that so many writers and artists have sought to convey over the centuries. The Cheops Pyramid is more interesting, because its interior burial chambers are open for inspection by the public. 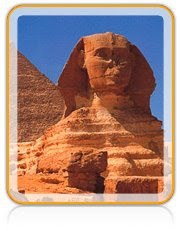 Not far from the pyramids is the Great Sphinx of Giza, which dates from the time of Chephren (2620 BC). Hewn from natural yellowish limestone and standing 65 feet-high and 187 feet-long, this unforgettable statue combines, the head of a Pharaoh with a lion's body. Situated on the spur of Muqattam Hills, the Citadel dominates Cairo 's skyline, and was the dense centre of the city and Egypt for almost 700 years. Its construction was initiated in 1776 by Saladin and completed by Mohamed Ali. Mameluke sultans and Turkish governors later made it their residence, building places and mosques within the Citadel walls. Facing the Citadel is the Mosque of Sultan Hassan, built between 1356 and 1363 and perhaps the most majestic monument of Arab architecture in Egypt . The tour also includes a visit to Khan El Khalili, a famous Cairo bazaar dating back to the late 14th century. Coptic Museum : The famous Coptic museum is built on the site of the Roman fortress of Babylon , constructed about 30 BC under Augustus and rebuilt in the time of Trajan. 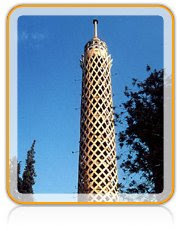 Inside the fortress are several Coptic churches and the collection of Coptic art in the world. Ben Ezra Synagogue: The Ben Ezra Synagogue stands in a pleasant shady garden in the centre of Cairo . Its long existence is attested to by the accounts of many travellers who visited it over the centuries, including Benjamin of Tudela in the 13th century, who records that he saw the Torah of Ezra- the Scribe there. The first Jewish synagogue was destroyed when the Romans occupied Egypt and was later rebuilt by Abraham Ben Ezra, the chief rabbi of Jerusalem . It contains a number of artifacts, including a Torah on gazelle skin dating from the 5th century BC, a drawing of a seven-branched candelabra on deer skin, and the manuscript known as the “Atlas of Moses”. Memphis : Memphis served as the capital of Upper and Lower Egypt some 5,000 years ago during the First Dynasty. 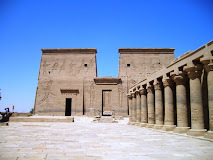 Menes, the first pharaoh of this dynasty, built a great, white-walled palace and the Temple of Ptah there. Sakkara: One of the most exciting historical and archaeological areas in all of Egypt is Sakkara, situated about 12 miles southwest of Cairo . The site is dominated by the famous step pyramid of King Zoser. It was the first pyramid built in ancient Egypt , preceding those at Giza by many centuries, and is the work of the famous Pharaonic architect, Imhotep. Manial Palace : A residence of the crown prince Mohamed Ali of the royal family, contains a collection of Ottoman period exhibits and artifacts of the former royal family. 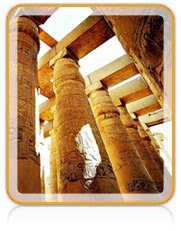 Nilometre: It dates from 861, a stone-lined pit that descends well below the level of the Nile . In the centre of the pit is a column with 16 cubit markings (a cubit is equal to about 21 inches). When the Nile water rose during floods' time, the early Egyptians could tell by the water's highest point on the column what the level of the Nile would be that year. Papyrus Institute: At the Papyrus Institute workers replicate the process used by ancient Egyptians to produce writing material from the papyrus plant. Islamic Museum: Is a noted depository of Islamic art from Egypt , Turkey and Persia dating from the 7th to 19th centuries. It was founded in El Hakim Mosque in 1880 and moved to its present location in 1903. El Seheimy House: Is a charming example of a typical Cairo home during the 16th and 17th centuries. Formerly a merchant's house, it includes a pleasant interior courtyard with trees, flowers, a well, and a flour mill. Ibn Tulun Mosque: Completed in 879, Ibn Tulun Mosque covers 8.5 acres of land and is designed in the classical courtyard style. It is well-known for its pointed arches, beautifully carved stucco, and Koranic inscription in sycamore wood. The Gates: Its surrounding is what we call now the Old Cairo. The Fatimite walls were built by Badr El Gamali between 1087 and 1092. Their famous East and West gates, Bab El Nasr (Gate of Victory) on the East, and Bab El Fotouh (Gate of Conquests) on the West, are of special interest. The mechanism used to open and close Bab El Nasr was used 100 years earlier in Egypt than its first appearance in Europe . Inscribed on the walls are the names of French officers who came to Egypt with Napoleon Bonaparte's expedition. The Anderson Museum : This museum is actually a combination of two different styles. The 18th century houses were joined together and finished by Major Gayer-Anderson, an Englishman. It is one of the best preserved and furnished houses of historic Cairo and gives a good idea of the degree of comfort and luxury enjoyed by wealthy Cairenes 200 years ago. Of particular interest is the large reception room and balcony, which is enclosed with a wooden Mashrabiyah screen that allowed the ladies of the harem to look down on male visitors and their festivities. City of the Dead: The City of the Dead is Cairo 's sprawling northern cemetery where the Mameluke sultans built their fine tombs, surrounding these with thousands of mausoleums and burial plots. Little houses were built as places of visitation, enclosing or adjoining family plots. Guests enjoy a fabulous 45 minute show at the feet of the Pyramids of Giza, held every evening. English speaking shows are on everyday except Sunday. French speaking shows are everyday except Thursday and Saturday. German speaking shows are only on Sunday and Wednesday. Italian speaking shows are on Tuesday and Saturday. Spanish speaking shows are on Monday and Saturday. Arabic and Japanese speaking shows are on Thursday. Russian speaking show is only on Saturday. Guests can enjoy a typical Egyptian dinner at a big tent near the Pyramids in Giza or aboard a riverboat on the Nile . The evening includes a spectacular Egyptian show with belly dancers and other folkloric performers. The basilical Church of Abu Serga was constructed above the cave in which the Holy Family took refuge. Built in the fifth century over the Southern gate of Fort of Babylon, the basilical style church of El Mo'alaqa is rich in antiquities from the early Christian era. The eighth century church contains a number of valuable icons. Completed in the fifth century and rebuilt in the 10th century, the Church of St. Barbara is still surrounded by its original wooden portal. The basilical style church was built over the ruins on an older church and includes a rare hall that dates back to the 13th century. Recently built in the Abbasia area, St. Mark's Cathedral is the largest church in Africa . The remains of St. Mark, the first apostle to spread Christianity in Egypt , have been transferred to the cathedral. Wizaret El Ziraa St. , Dokki. Open: 9.00 am - 2.00 pm. Closed: Monday. Darb El Asfour near Qaloun Mosque, Al Azhar. Open: 9:00 am - 4.00 pm. Closed: Friday. Noon - 1.00 pm. Ahmed Ibn Tulun Square . Open: 8.00 am - 4.00 pm. 2, Saad Zaghloul St. , Falaki. Open: 9.00 am - 3.00 pm. Salah Salem St. Open 9.00 am - 5.00 pm. Mar Guirguis St. , Old Cairo . Open: 9.00 am - 4.00 pm. Nile Street , (near Yacht Club). Open 9.00 am - 7.00 pm. Tahrir Square . Open: 9.00 am - 2:00 pm , 4.00 - 5.00 pm. 14, Ramsis St. Open: 9.00 am - 1.00 pm; Wed: 6.00 - 9.00 pm. Closed: Saturday, Sunday & Monday. Corniche El Nile, Maadi, Athar El Nabi, Old Cairo . Open from 9.00 am.- 1.00 pm. Abdin Palace : Open 9.00 am - 3.00 pm. El Giza St. , Giza . Open 10.00 am - 3.00 pm. Roda Island . Open 9.00 am - 3.00 pm. The Citadel. Open: 9.00 am - 5.00 pm. Closed: Tuesday. Opera House. Open 9.00 am - 3.00 pm. Fri. 9.00 am - 1.00 pm. El Hussein Mosque, Darb El Tablawi, Gamalia. Open 9.00 am - 2.00 pm. Closed: Friday. Amr Ibrahim Palace - Zamalek. Open: 9.00 am - 5.00 pm. Ahmed Maher Sq., Port Said St. , Bab El Khalk. Open: 9.00 am - 4.00 pm. Friday 9.00 am - 12.00 pm. 18, Ismail Abul Fetouh St. , Dokki. Open: 9.00 am - 1.30 pm. Fri: 9.00 am - 11.30 pm. Gezirah Exhibition Grounds. Open: 7.00 am - 8.00 pm. Closed; Friday. The Citadel. Open: 9.00 am - 5.00 pm. The Post Office, Ataba Sq. Open: 10.00 am - 1.00 pm. Closed; Friday. The Railway Station, Ramsis. Open: 9.00 am - 2.00 pm. Closed; Monday. 82, 26th of July St. , Boulak. Open: 9.00 am - 4.00 pm. Ghamra. Open: 9.00 am - 2.00 pm. The Great Pyramid of Cheops. Open: 9.00 am - 5.00 pm. Ain Helwan Station, Helwan. Open: 9.00 am - 5.00 pm. Closed: Friday. 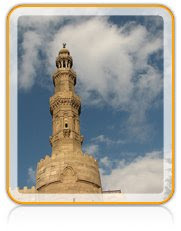 3, El Sheikh Mohamed Abdou, Al Azhar. Hosh El Kadem St. , off El Ghuriya. The house of Gamal Eddin El Dahabi is a fine example of early 17th century Arab homes. Haret Monge, off Port Said St. Open: 9.00 am - 1.30 pm.